From its majestic mountain ranges & stunning rivers, to Warsaw’s urban pulse & Gdansk’s stately maritime heritage, and not forgetting its delicious food & tasty beer Poland certainly has something for everyone. Our tour begins in the university city of Poznań, where a collage of architectural styles in its churches, cobblestones and colourful burgher houses awaits you. From here we travel to Wroclaw, now part of Poland it’s a city shaped by a chequered history of Bohemian, Hungarian, Austrian, Prussian and German occupation of years gone by. In Częstochowa take time to visit the monastery of Pauline Jana Gora, home and Sanctuary of the revered Black Madonna icon, Queen of Poland, before we arrive in Krakow, Poland’s second largest city. Traditionally the home of the Polish monarchy, many of whom were crowned and laid to rest in its magnificent Wawel Cathedral, today Krakow is a thriving city waiting to be discovered. Whilst in Krakow we visit the extraordinary Wieliczka Salt Mines, designated a UNESCO World Heritage site with miles of tunnels richly decorated in salt sculptures and ornamented walls. Also not far from Krakow is a reminder of Poland’s difficult past when we visit the moving Memorial & Museum of Auschwitz-Birkenau. On to Poland’s capital Warsaw, a phoenix-like city that survived many wars throughout its long history before being reduced to rubble during World War II. Today Warsaw has been painstakingly rebuilt into a vibrant city where aristocratic mansions sit alongside graceful Art Nouveau buildings, Soviet socialist realism and contemporary glass skyscrapers. 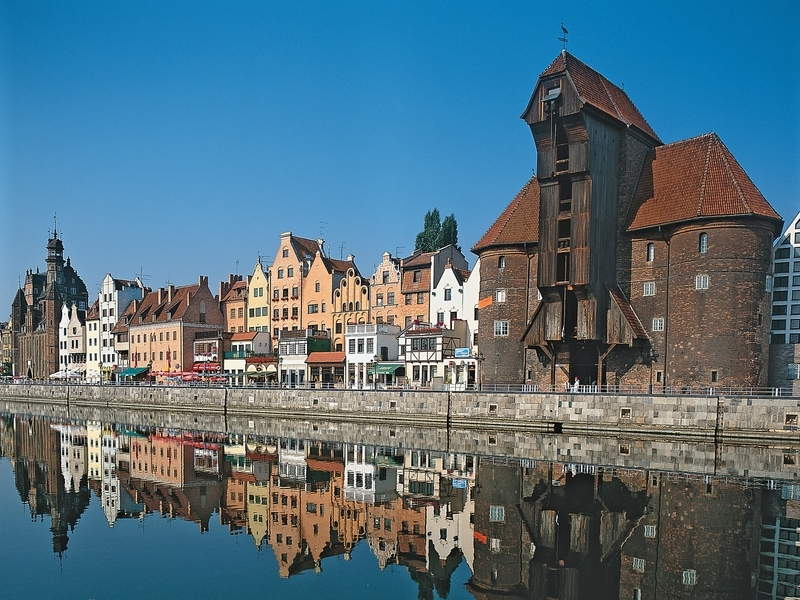 For the final part of our tour we travel to the medieval city of Torun, the birthplace of astronomer Nicolaus Copernicus; and the cultural melting pot port city of Gdansk, home to the extraordinary Elblag to Ostroda Canal featured in Michael Palin’s ‘New Europe’ programme. Having completed the tour, you will understand why Poland really does have something for everyone. We meet at a campsite near Erkner, North East Germany. This evening we will have an informal Drinks Reception, an opportunity for everyone to get together for the first time. Today we will have a guided walking tour. The university city of Poznań is one of the oldest in Poland and occupies a strategic position on the Warta river, in west-central Poland. During the 13th century it was the capital city and is now an important centre of trade and industry. Crowded with churches, cobblestones and colourful burgher houses, Poznań’s Old Town is a collage of architectural styles which we will see during the tour. Lunch included in a city restaurant. Free day today, an opportunity to relax or take a walk around the lake of the park in which our campsite is located. Wroclaw has been fought over for many centuries. In the 19th century it became part of the German Empire and its name was Germanized to Breslau. In the 1930s it became one of the strongest support bases for the Nazis who won control of the city by a massive majority in the elections of 1932. It became part of Poland at the end of World War Two and reverted to its original name of Wroclaw. Today it is a unique European city of mixed heritage and was the 2016 European City of Culture. Today we will have a guided walking tour with lunch included. With a Tram Stop near the campsite, you can revisit Wroclaw today. Time to explore Częstochowa, you will find the Pauline Jana Gora Monastery, the most popular shrine in Poland and Sanctuary of the revered icon known as the Black Madonna. It has been associated with Poland for the past 600 years but its origins have been lost and are greatly debated by scholars. Legend has it that it was painted by St Luke on a piece of table belonging to the Holy Family. The Monastery is only a short walk from the site (a small entrance fee is payable) and if you time your visit correctly you may be able to see the icon along with many other treasures kept at the Monastery. There has been a human settlement on the site of what is now Krakow since at least 200,000 BC and by 965 it was the bustling trade centre of Slavonic Europe. For centuries it was the traditional home of the Polish monarchy, many of whom were crowned and later buried in the magnificent Wawel Cathedral. Today it is Poland’s second city and vies with Warsaw for cultural supremacy. Today we have a city tour and lunch in a city restaurant. There will be an excursion to the Memorial and Museum of Auschwitz-Birkenau. The memorial and museum occupies two parts of the network of concentration and extermination camps built and operated by the Third Reich in Polish areas annexed by Nazi Germany during World War Two – this can be a moving experience. Free day today, for those who would like to go back into Krakow for more sightseeing or shopping there is a bus stop just outside the campsite. An excursion to the remarkable Wieliczka Salt Mines. The mines have been worked for 900 years, producing 200 kilometres of passageways and 2,040 caverns, many with underground lakes and chapels. However, it is, perhaps, the sculptures and ornamentation carved into the crystalline salt that make the mines so unique and have won its designation as a UNESCO World Heritage site. The tour route is 2.5 kilometres long and there are 400 steps in all but there is a lift to carry visitors back to the surface. Lunch included. We visit the city today, located astride the River Vistula, Warsaw is a phoenix-like city having survived so many wars through its history. During World War Two it was reduced to rubble but the Old Town has been painstakingly reconstructed to such an extent that it is hard to believe it is only fifty years old. Known as the ‘City of Palaces’ its many aristocratic mansions now sit alongside subtle Art Nouveau buildings, and contemporary glass skyscrapers. Lunch is taken today in a city restaurant. Torun is one of the oldest cities in Poland and is regarded as particularly special because it avoided destruction during World War Two. Its origins date back to the 3rd century when the Teutonic Order of Knights built a castle here. The city has preserved the original medieval street pattern and many outstanding buildings remain from the 14th and 15th century, including the house of the astronomer, Nicolaus Copernicus, who was born in Torun. We will have a guided tour today with lunch included. A free day. In the evening we will have a group dinner in the campsite restaurant. We will take a trip to Malbork Castle, one of the mightiest fortresses of medieval Europe. Building began in the 13th century and was expanded considerably when Malbork became the capital of the Teutonic Order of Knights. The red brick walls of the Middle and High Castles are surrounded by defensive walls interspersed with towers and gates. The Castle’s enormous size can best be appreciated from the banks of the Nogat River. The Museum inside offers many attractions including a number of displays of ancient armaments, amber, porcelain and handicrafts. Today we will visit the extraordinary Elblag to Ostroda Canal, named as one of the ‘Seven Wonders of Poland’ and a protected Historic Monument. The canal was built in the 19th century to carry trading barges from Lake Druzno to Lake Jeziorak, a distance of 80.5 kilometres. The water level changes by 100 metres in between, too steep for conventional locks to cope with. The problem was overcome by an ingenious system of slipways bordered by parallel rail tracks upon which the specially built boats were carried over the dry land on trolleys. You may remember the Canal featuring in one of Michael Palin’s travel programmes. On the Baltic coast, the one thousand-year old city of Gdansk, or Danzig in its Germanized form, was, and remains, Poland’s principal seaport. Located close to the medieval boundary between Slavic and German held lands the city was a melting pot of both cultures and diverse ethnic groups. It is the influence of this blend of cultures and people that gives Gdansk its unique feel. It was here on the 1st September 1939 at 4.30 in the morning that the first shot of World War Two was fired. The Nazi German battleship ‘Schleswig-Holstein’, ostensibly on a goodwill visit, sailed up the Vistula and fired at point blank range on the Westerplatte Garrison buildings. It was here too that the Trade Union movement, Solidarity, was formed, an act that triggered the eventual collapse of the Soviet Empire. We will have a guided tour of this fascinating city with lunch included. The tour ends this morning, all subsequent costs incurred are your responsibility. If the Tour Directors are returning to Calais you may accompany them by a route and timings of their choice.